The Eye of the Shah: Qajar Court Photography and the Persian Past presented some 200 photographic prints, a number of vintage photographic albums, and memorabilia that utilized formal portraiture of the shah. 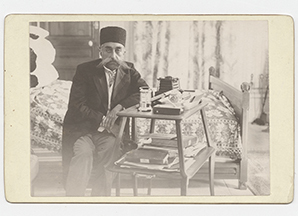 The exhibition showed how photographers—many of them engaged by Naser al-Din Shah Qajar (r. 1848-1896), the longest reigning Shah of the Qajar Dynasty (1785-1925)— ultimately created a portrait of the country's ancient and recent past. Most of the photographs in the exhibition had never been publicly displayed. The Eye of the Shah included unprecedented photographs of life in the royal court in Tehran, such as images of the last shahs of the Qajar Dynasty, their wives and children, and court entertainers. These were complemented by photographs of iconic ancient monuments and sites, such as Persepolis and Naqsh-e Rostam, capturing Iran’s expansive and rich historical past. The photographers also depicted the Iran of their day through images of the military, the railway, and the postal system, while the daily lives of Iranian people were revealed through photographs showing shopkeepers, street vendors, and field workers. Additionally, The Eye of the Shah featured pieces by two modern-day Iranian photographers, Bahman Jalali (1944-2010) and Shadi Ghadirian (b. 1974), who evoke and sometimes incorporate images of photography from the Qajar Dynasty, illustrating the continuing and powerful influence that Iranian photography of 19th and early 20th century photography has in the country’s contemporary art world. This exhibition was organized by the Institute for the Study of the Ancient World and made possible by the generous support of the Selz Foundation, the David Berg Foundation, Sharmin and Bijan Mossavar-Rahmani, and the Leon Levy Foundation. Special loans provided by the Kimia Foundation and the Collection of Azita Bina and Elmar W. Seibel.